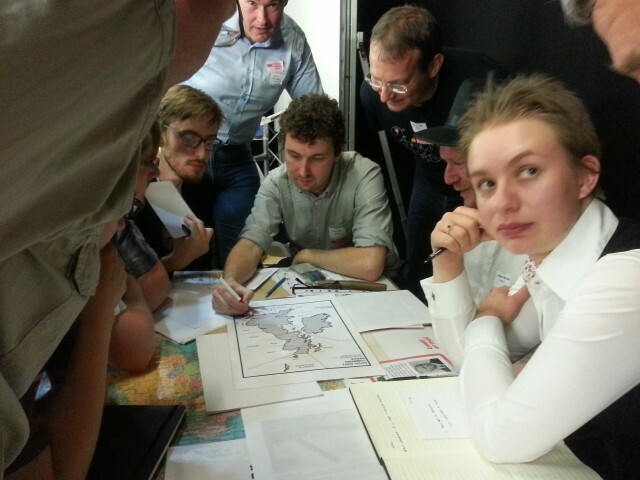 Today I played in Undeniable Victory, Ben Moore’s megagame of the Iran Iraq War. I was an Iranian Radical and a member of the Council, starting off as the Procurement Minister responsible for buying military kit. I was a late entrant to Undeniable Victory, getting a place because someone else couldn’t make it. That said I was pretty happy with being cast as a radical Iranian. I like political roles, and being just off the side of the main targets. Procurement Minister was senior enough to be interesting, yet junior enough not to be an automatic target. I was one of three radicals in the seven member Council. There was always going to be a move to displace one of us to change the balance of power. The Conservatives had the First Minister and Interior Minister to start with. My fellow Radicals were the Defence Minister and the Infrastructure Minister. The Moderates had the Finance and Foreign Ministries. Ayatollah Khomeini was umpire controlled and mostly absent dealing with religious matters. As a radical council member I deliberately skipped over some of the military bits of the briefing for Undeniable Victory. I didn’t think it would be right for me to have a detailed understanding of the combat system when there were players in the military HQs responsible for briefing me on what they needed. I started off with a straightforward policy of equipping the Iranian Revolutionary Guard Corps with good quality equipment so that they were at least as good as the army. My chief procurement officer in the military high command (Tim) was a moderate. We had a bit of conflict sorting out how to work things, but we came to a workable agreement. I became aware very early on that he was doing his own deals to get kit as stuff I hadn’t ordered was appearing. Also kit I’d ordered for the IRGC was going to the regular army. This almost became my undoing. The Radicals, under the august leadership of the Defence Minister, narrowly failed to boot a moderate off the Council and replace them with a fourth Radical. This was followed by us swapping me with the Interior Minister (pictured above). The latter immediately brought a case against me for corruption and treason by way of evidence he’d collected of dealings with the Israelis. I denied this vehemently and blamed Tim for any transgressions, mentioning that he’d been acting without authorisation on other matters. Witnesses were called and my version got some corroboration. So Tim was sent for and he immediately confessed to getting kit off the Israelis for free. His testimony was very eloquent and I would have applauded if I’d not been so relieved that I wasn’t going to end up on a lamppost. The Council accepted Tim had acted in the best interests of the revolution and he was warned not to act without authorisation from the Procurement Minister again. He was also sent to a re-education retreat to contemplate the error of his ways. (OOC he was told to go stand on Anerley Station platform for a minute before returning to the game). If I ever had to give advice to another megagamer it would be that you don’t want to let me be Interior Minister unless you’ve got a lot of people you want to see dead. Dave, our radical leader and a veteran megagamer, was well aware of this when he organised the swap. He also managed to change the form of the government to advantage the radical position. This sowed the seed for our Undeniable Victory. Sadly for Dave he was the victim of a council reorgisation in the following season. We’d been too successful too early, and as the faction leader he got hit. He was swapped out with the Chief of the Army. Alex, a Conservative became the new Defence Minister and lasted there to almost the end of the game. I let the other Radical, Callum, take leadership in the Council for a bit. I went on a tour of the front to audit players and procurement to make sure there were no chemical weapons in play. This was in response to allegations that we had used them. The front line visit was an eye opener, I’d previously had no real idea how things were going because the reports back were vague at best. Back in the Council we’d suffered a massive funding cut for the Interior Ministry. All the money was going into procurement and social support. The latter was something I was strongly in favour of, and I’d rather not repress the people unless they were acting against the spirit of the revolution. I made the political dissidents kick off by blaming them for everything. This played out well because they blew up a military HQ player and got him out of my beard. At this point the war was going very favourably for us. Militarily it really was looking like an undeniable victory. However the Ayatollah intervened because he didn’t think we were playing nicely enough with each other. He was assuredly correct. Some subtle agreement and positive suggestions couched in suitably revolutionary language helped manoeuvre others into actions that suited my agenda. I also did a deal with the Conservative First Minister to try and position the Moderates to take the fall when the time came. The radicals got the Iranian war goal shifted to total war and we also promoted obedience to the Ayatollah’s desires to strike hard at the little satan. An election also happened at this time and the Moderates campaigned on an anti-Arab platform. The Conservative faction Wendy anti-colonial and we chose anti-imperial. We also chose to lose the vote, playing out worst card. 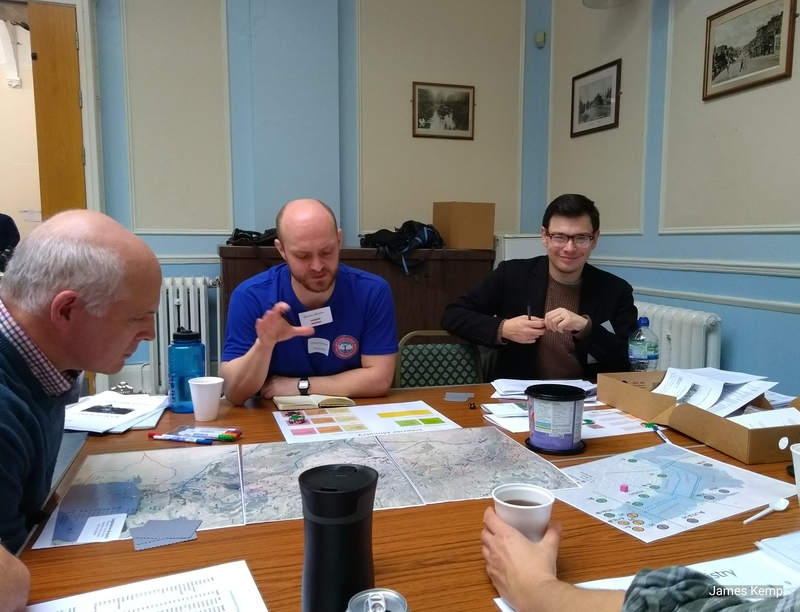 It didn’t make any difference to the Council freedom of action and we came out with our radical credentials intact and a better chance of winning another crucial vote (I kept back the Ace, which was the highest card possible for resolving votes, this was very useful later). The Council buckled down and focused on the war. We came under increasing pressure from the USA, via the Foreign Minister (Bernie) to end the war. Bernie was a moderate and had taken a very technocratic position, acting in the best interests of the foreign relations agenda throughout. It was clear he had a specific agenda, but as far as I could tell it broadly matched mine, so I supported him. I even did so when the Conservative faction tried to swap him off the Council. He was someone we could work with. Shortly after this we suffered a massive cruise missile strike against the southern oil terminals. This was the US deadline to negotiate running out. Our undeniable victory forced them to act directly. We’d also lost half our revenue because the oil price had collapsed. So it was time to sue for peace. But this needed careful handling, we still needed the undeniable victory for the home front. The Council discussion was interesting. Ollie and I saw the inevitable, as did Bernie. Others were for continuing to spend scarce funds on procurement at the cost of social support. At this point there was another bomb in the Council. Chris, the Procurement Minister, was killed but the rest of us were fine. He was rapidly replaced by another Conservative from Army HQ. I later discovered that Tim, the procurement officer, had been behind the bomb as revenge for beingput on trial for dealing with the Israelis. We then got informed that Ayatollah Khomeini was gravely unwell and believed that he was dying. It was time to pick a successor. Callum and I had a quick chat, I over-ruled him as the Radical choice on the grounds that he’d been happy, as Finance Minister, to cut social support and buy tanks when the war was effectively over. The Moderates surprised me at this point. Rather than nominating a Council member Bernie went off and found the Air Marshal and spoke eloquently about all his many successes and sacrifices for the revolution. It looked like he might actually get picked without a vote. So I also praised him and said that he was a true hero and should absolutely definitely replace on the Cpuncil. whoever might be chosen as the successor to Ayatollah Khomeini. 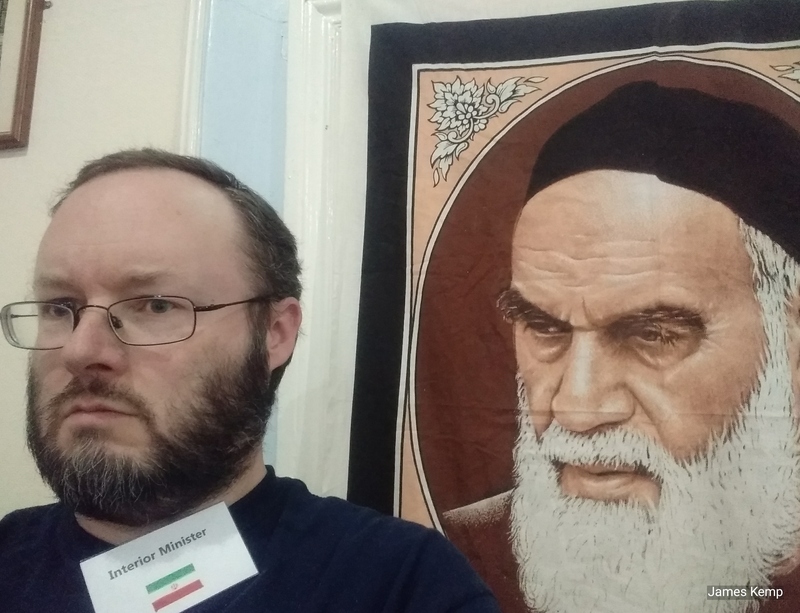 I also prayed that it might be some time before the successor need take up post as the new Ayatollah. So it went to a vote. I played the Ace I’d kept earlier. Thankfully Allah was great and saw that I submitted to his wisdom. It wasn’t quite over yet. Although on his sick bed we managed to present a united front and persuade the Ayatollah that the surest way to safeguard the revolution was to discuss peace with the Iraqis. He agreed and a peace conference was set up. Head of State, First Minister and Foreign Ministers were invited. As the designated successor I tagged along. Mostly I stood at the edge and listened. In the background news of the peace had spread. My fellow Radicals in the army were upset and worried that the Moderates had sold out the revolution. They marched on Teheran with a Division of the IRGC. I took time away from the peace conference to deal with the purge. One of the arrested Moderates (the previous Finance Minister) confessed to being involved in a plot to assassinate Ayatollah Khomeini just before the Americans had forced the peace conference. He was promptly sent for a show trial. The Radical Generals were told not to be too indiscriminate and to make sure there was some sort of evidence against the people they were arresting. It was clear I wasn’t going to be able to stop them completely. I then got a call from the Ayatollah. He was very worried about all the shooting he could hear. Was a counter revolution under way? I reassured him that there was evidence that the Moderates had been planning to kill him, and that we were reinforcing the revolution by arresting those involved. That was where the game ended. A tentative peace deal underway and a second revolution in Iran to strengthen the radical position. Certainly the Radicals appear to be in the ascendancy for the next few years. Iran will rise rebuilt as a shining example of radical Islam.